Aravinth Kumarasamy is a man who is passionate about Bharatanatyam and other classical forms. 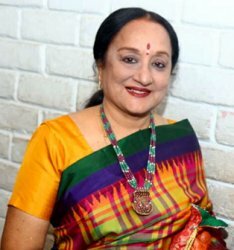 Decades ago, Neila and Sathyalingam, who had honed their dance and musical skills in Kalakshetra, settled in Singapore and did pioneering work in teaching dance. On one of my visits years ago they introduced Aravinth as the person to whom they were handing over the mantle to run their well established institution, Apsaras Arts. Little did I guess that one day Aravinth would be a leading figure in the Arts scene of Singapore. Well, hard work, imagination, a spirit of adventure, and a certain commitment beyond the merely commercial have taken him places. His early experience with music (the veena), choreography (Temple of Fine Arts) and mentoring by Neila, have helped in establishing his credentials. 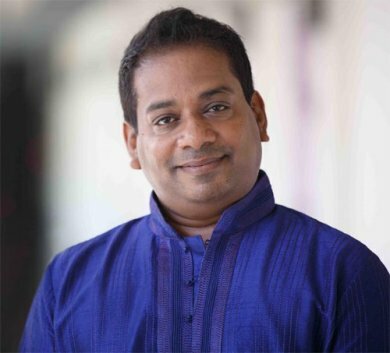 With serious intent of unity in diversity, he has formed links not only with innumerable artists in Singapore and other South East Asian countries, but also with Chennai based dancers and musicians. Added to this is his bringing some buzz into the dance community every summer uniting many students and teachers at a lively camp called Dance India Asia Pacific in collaboration with Milapfest of Liverpool. His latest achievement was to fill up the big theatre of the Esplanade with an enthusiastic crowd to watch 'Anjaneyam', which had a huge cast of dancers and musicians. With visual effects as backdrop, a gigantic image of Hanuman rose up, whilst Hari Padman of Kalakshetra playing Anjaneya, stood in a pose in front of it on a raised platform, as the sound of drums reached a crescendo.....this was the impressive VISWAROOPAM vision in 'ANJANEYAM.' All was said in a trice....this scene epitomized the texture of the production with maximum music, massive visuals, colourful costumes, quick changes of scenes and multiple dancers. This spectacle was staged as part of Kala Utsavam by Aravinth and the Apsaras Arts dance group in collaboration with Esplanade, joined by Chennai dancers and musicians as well as a Javanese ensemble. Aravinth is quite a task master. He thinks big...he has to, if anything must be staged in the big theatre, and makes everyone work hard. He may not often think beyond one show. Perhaps he can edit and fine tune this one to make a run in other venues possible. It is worth it because so much has gone into its making. Who does not like a new twist to an old tale?! So it was, with the story of Hanuman conceived as a miraculous brother to Rama. The pre-story unwinded in a rather leisurely manner, like old Indian dance drama traditions. The rest of the script had everything in it for telling the story, including flashbacks. For an audience familiar with the Ramayana, it was easy to follow. However, one sat up only when dramatic developments took place. Conflict makes for the best drama. Here too, a mix of Indian and Javanese martial movements brought verve and vigour to the scenario. Mohanapriyan Thavarajah, the principal dancer at Apsaras did it as Jatayu and Indrajit with a masterly touch. There were flashes of impressive visual impact in many scenes. For example, there was magic in the movements and mystery in the lighting in the Surasa - the sea demoness episode. Other scenes too were enacted sincerely even if there was a busy stage distracting the viewer from staying engrossed in the central figures. The musical score helped in many instances, giving a lift to the drama. The quadro sound system was in fact very impressive. Many voices, instruments and effects were produced very clearly, giving the desired grandeur to the soundscape composed by Rajkumar Bharathi. Choreographing the corps de ballet is tricky. Apsaras and Gandharvas in any show of Indian mythology can fill the stage with some good dance steps. Here too, the male and female dancers did their best to yield to the director's wish to say "this is a mega show." The pace of the scene changes was fast and the dancers accomplished their moves with alacrity. Hari Padman as Anjaneya sincerely kept his role vibrant. He is a worthy character artist.....on a vast stage he even ventured to display deep-felt passion and emotion. It was needed and it can be done only by a mature artist. Most other characters did what they were asked to do. Osman Abdul Hamid as Ravana went the extra mile, lending some flamboyance while enjoying his role. 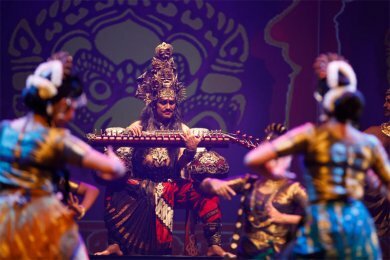 This was a coordinated juxtaposition of Javanese music, musicians and dancers, with Bharatanatyam in all its variety. Comparing and contrasting or blending was not the goal. The Kathakali leaps introduced many years ago by Rukmini Devi for Hanuman made a nostalgic statement. It seems there is no alternative.......at least for now. This is not a review of the show....it is just a few observations made with my keen eye for the core principles of choreography. I laud the efforts of the whole team, in producing a show, given a limited time frame, without a dull moment, and with enough showmanship to keep the audience engaged for three hours. The director has worked on it like an elaborate jigsaw puzzle, satisfied in the end that everything fell into the right place. Jai Hanuman! May his blessings make the art of dance the elixir of life!